Louise Bowen is a PhD researcher who specialises in examining the behavioural aspects of safer transport. 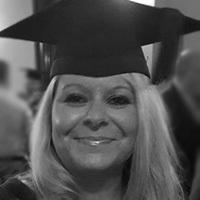 Louise has an MSc in cognitive neuroscience in addition to a PGCE, and is a Fellow of the Higher Education Academy - and as such spends a lot of time teaching in addition to her PhD studies. Louise’s PhD focuses on well-being, as well as other factors, with the aim of formulating empirically validated interventions to mitigate unsafe transport user behaviour patterns, thus reducing fatal, serious and minor accidents. This in turn may lead to: economic savings linked to the reduction of accidents; safer use of vehicles and increased awareness of other users; effective enforcement and training schemes based on reliable behavioural models; safe integration of new types of vehicle and increased usage of safe behaviour. This presentation will outline a study which examined driving behaviour, driving skill and driving hazards and their potential links to well-being, in a sample of 224 undergraduate psychology students at Cardiff University. A cross-sectional, online survey measured driver behaviour (distraction, aggression) and wellbeing (positive outcomes, negative outcomes, positive and negative appraisals). Factor analyses showed that driving behaviour, driving skill and driving hazards loaded on independent factors. Hierarchical multiple regressions demonstrated that poor driving behaviour predicts negative wellbeing and appraisal, whereas more pro-social driving behaviour was predictive of positive wellbeing and appraisal. These effects remained significant when established predictors of wellbeing were co-varied. Therefore, the research has identified links between wellbeing and driving behaviour and as such provides an opportunity to consider ways in which drivers may be supported to achieve more positive safety behaviour while on the road.